When BBC Radio Leeds burst onto the scene fifty years ago this month the small team of broadcasters were determined to make an impact: from talking budgerigars, the Only BBC Programme That Money Can Buy, the World Tune-gargling Contest and Bring a Disc. 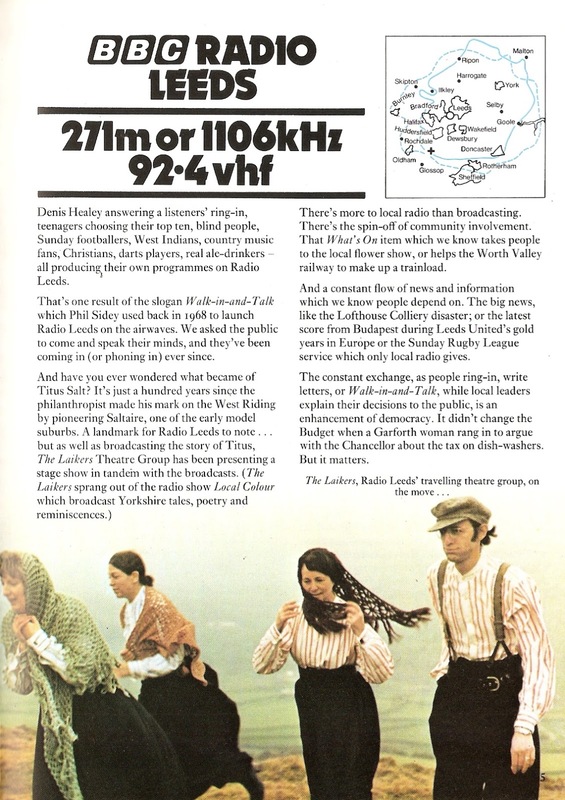 But amongst the funny and the frivolous was a commitment to collect and broadcast their own news, at the time a decision that went against the grain of the existing BBC experimental local radios. The man who successfully got the backing from the BBC bigwigs in London was the first station manager Phil Sidey. Sidey had first broadcast with the British Forces Network (BFN) in Klagenfurt, Germany before working in a number of journalistic posts including a spell with AP. He joined the BBC in 1956 as a sub-editor for External Services news and moved to television news in 1964 where his roles included news producer on Twenty-Four Hours. At the time of his appointment as manager at Radio Leeds the local radio system, which had just started to roll-out the previous November, was that local news was to be sourced from newspapers and news agencies in the area. 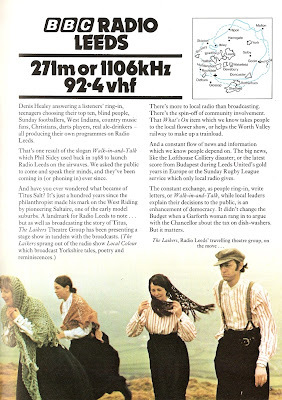 Sidey convinced Frank Gillard, then Director of Sound Broadcasting, and others that he "wanted to collect my own news in Leeds and construct my own bulletins, mixing the local with national and international news," a scenario which is now, of course, the norm. His news team included the Yorkshire Evening Post's Allan Shaw as news editor (who went on to manage Radio Teesside in 1970 and then Radio Manchester from 1975), Jim Brady as sports editor, Derek Woodcock (later station manager at BBC Radio Newcastle and then BBC Radio Bristol), Geoff Hemingway and Stephen Phillips. A camera crew from BBC1's Twenty-Four Hours was on hand to capture the opening of the new station. As this page from the Radio Times week commencing 26 April 1969 shows the station pinned its news credentials to the mast. "Leeds and the World. New-style bulletins of international, national and local news, and interviews; with direct lines to Leeds City Police and the West Yorkshire Police Headquarters and live reports from the Radio Car." 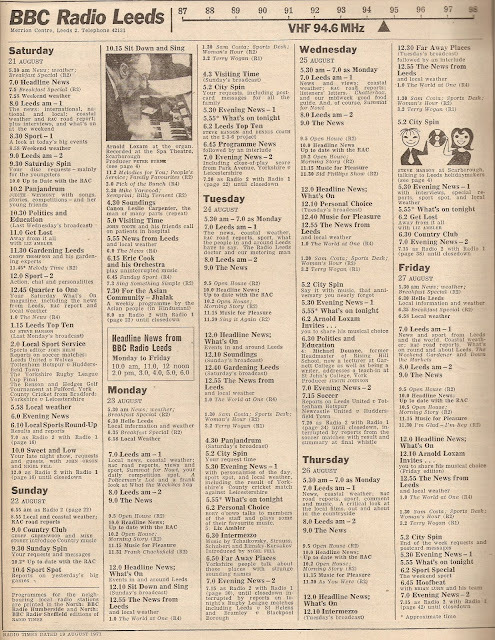 Amongst the names in the 1969 schedules are Liz Oyston who opened the station and worked at Radio Leeds for nearly 20 years, mainly under her married name Liz Ambler. Experienced broadcaster Rory O'Dowd was also on air at the launch, he'd worked in New Zealand radio and TV for years and Diana Stenson moved on to Radio Manchester in 1970 and later network radio in the city as a producer for Woman's Hour and Gardeners' Question Time. Joan Elliott, with her programme "for women to interest the men", was a former local news journalist with the Leicester Mercury and Portsmouth Evening News. Married for a time to Gerald Nethercot - who went on to be the BBC's man in the Midlands and the first station manager at BBC Radio Nottingham - she started to freelance for the BBC and contributed to Sunday Out, for the Midlands Home Service, Woman's Hour and Today. Moving to the north east she was the woman's editor on the Newcastle Evening Chronicle and began to appear on Tyne-Tees and the BBC. When her then husband Jeffrey Slack moved to Leeds, Joan eventually joined the new local station. Her show Joan Elliott Calls came complete with a Delia Derbyshire composed theme tune. A further move to London meant that Joan would work for BBC Radio London becoming a senior news editor. On retirement the family moved up to Durham. She died in 1999 aged 81. One of Radio Leeds' regular broadcasters in the twenty years or so was organist Arnold Loxam. Bradford-born Loxam had been playing the theatre organ since the 1930s and made many post-war broadcasts on the Home Service and Light Programme. Here he's listed presenting Sit Down and Sing recorded at Leeds City Varieties. Geoff Leonard's radio experience was all behind the scenes. He'd joined the BBC as a junior engineer in 1941 in the Birmingham control room, later at 200 Oxford Street, a Studio Manager for the Features department and attachments to TV presentation, TV news and the BFN as a producer before the move to Radio Leeds as a production assistant and then engineer. Geoff moved south again to BBC Radio Medway until his retirement in 1980. He died in 2004. Listed under Leeds on a Sunday is a young Phil Hayton who'd cut his broadcasting teeth on pirate Radio 270 and in the early 70s went off to Look North and then BBC News in London as a reporter and newsreader. His co-presenter Dave Williams was also an ex-pirate as a newsreader on Radio Caroline North. Angus Turner, presenter of Sounds Interesting, had worked for the BBC in the Leeds regional office on Woodhouse Lane. Journalist Michael McGowan was, from 1984 to 1999, the MEP for Leeds. Second engineer Bill Holt was also a folk artist and is here listed as producer of Country and Folk. His engineering colleague John Orson also appeared on air presenting Sweet and Low, he went on to be chief engineer at Pennine Radio. Robin Worman later joined Radio Solent and was the first voice on air when it launched in 1970. 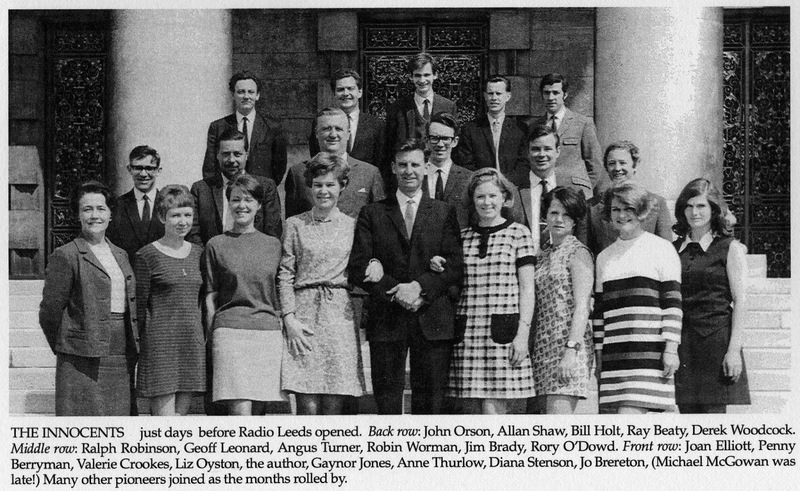 Not listed here but working at the station in 1969 was Gerald Jackson who moved over the Pennines in 1971 to help launch BBC Radio Blackburn (now BBC Radio Lancashire) where he remains to this day. The prize for the best title must surely go to Hoof Beat the Friday evening programme on horses and show jumping. As for Phil Sidey he went back to television in 1970 first as an assistant editor on Nationwide and then as Head of Network Production for the BBC in Birmingham. In 1994 he wrote a superb insight into the early days of BBC local radio called Hello, Mrs Butterfield..., grab a copy if you can. He died the following year. When Radio Leeds launched on Monday 24 June 1968 its studios were in that testament to sixties concrete brutalist architecture the Merrion Centre; later they moved to Woodhouse Lane and then in 2004 to St Peter's Square. This wasn't the first time that the city had been the home of a local radio service. From 1924 until the early 1930s BBC operated the Leeds-Bradford relay station (initially called 2LS) which carried the programmes of 2ZY in Manchester, and later the Regional Programme, but with occasional local input. The studios were on Basinghall Street before a move to Woodhouse Lane in 1933 on the site of an old Quaker Meeting House. This would remain the main Yorkshire outpost of the BBC for the next seventy years and for a while in the 50s and 60s had a strong drama production base for the radio network under the direction of producer Alfred Bradley. 1968 was a good year for broadcasting in Leeds. In March the BBC TV regional news magazine from Manchester, Look North, split and a Leeds-based alternative east of the Pennines was launched with Barry Chambers, David Seymour, James Hogg, John Burns and David Haigh. Meanwhile a month after BBC Radio Leeds came on air down at Kirkstall Road Yorkshire Television opened. 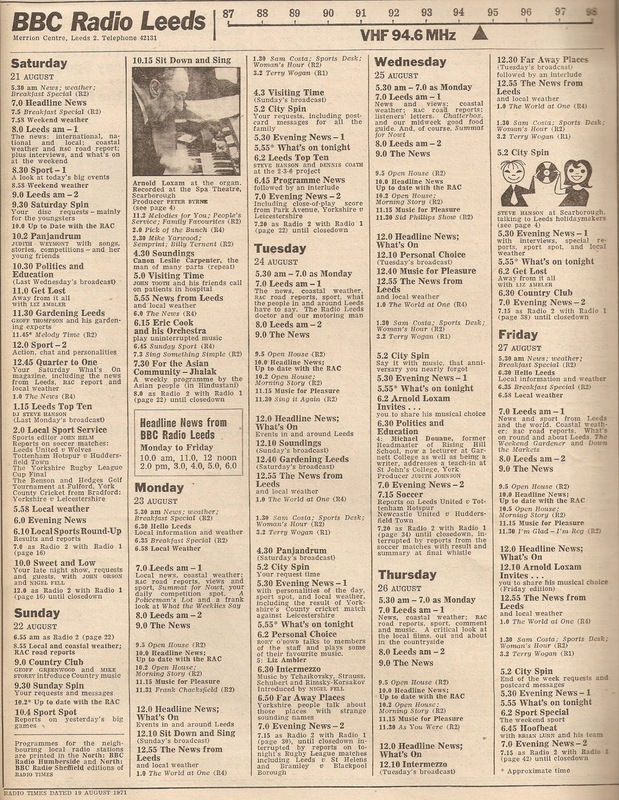 A couple of years after launch (for the week commencing 21 August 1971) the Radio Leeds schedule looked like this. On Saturday John Helm is listed as the sports editor. John, of course, went on to work for Sport on 2 and then ITV as a football commentator. Co-presenting Sweet and Low is Nigel Fell. Nigel had made his radio debut sending in taped shows under the name John Martin to the pirate station Radio City. He joined Radio Leeds in 1969, staying with the station for 30 years. For the week commencing 29 March 1980 Radio Leeds had this line-up. On Radio Leeds AM is former teacher John Hendry, later a freelance actor and now a spiritual healer. Alongside Liz Ambler on West Riding is Dave Hodgson, most recently associated with Kirklees Local Television, as is Barrie Davenport, listed here as a producer on Concert Pitch and Just Jazz (later he presented Great Northern Brass). Simon Says presenter was Simon Peters who was also a matchday announcer at Elland Road in the 70s and 80s. Simon's co-presenter was Claire Hansbro, later on BBC Radio Sheffield as Claire Kavanagh. 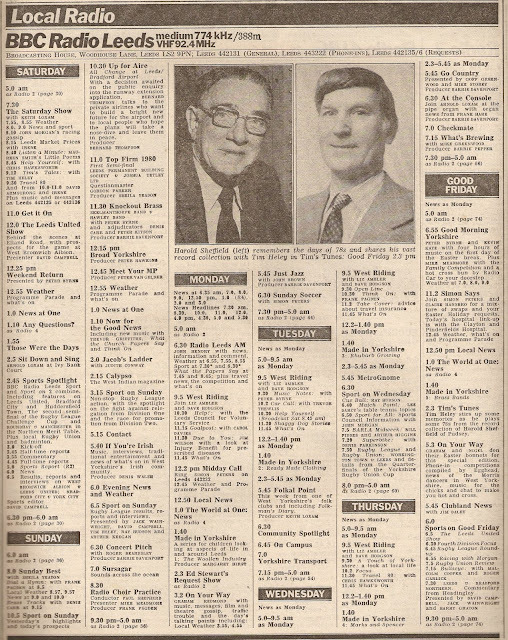 Note that Sports of Good Friday lists Yorkshire broadcasting legend Harry Graton (sic) as one of its presenters. Finally this schedule dates from week commencing 16 December 1989, and there are some very familiar names here amongst them Alvin Blossom, Peter Levy who now woos viewers to Look North from Hull and Miles Harrison who moved onto BBC sport, ITV and is now Sky's rugby union commentator. Ex-Pennine jock Tony Fisher was on breakfast show duty. He's had an extensive radio career, moving on from Radio Leeds to Radios Cleveland, Newcastle, Minster FM, Century, Kiss 105, Galaxy 105, Invicta, Wyvern, Southern Counties, Hereford and Worcester and currently appearing on BBC Essex. On mid-mornings was ex-Radio Aire's Jon Hammond. The lunchtime DJ is Ian Timms who then went to BBC Radio Devon and is currently on BBC Radio Cumbria. Two presenters are still on air at Leeds: Gary Copley playing big band and swing music and Tim Crowther who's looked after the Sunday morning gardening slot for over two decades, first with the late Joe Maiden and now with Graham Porter. BBC Radio Leeds is celebrating its 50th birthday this weekend with a Sunday afternoon special narrated by Tim Daley followed throughout the week by a number of special shows from a pop-up studio in the Merrion Centre. John Hendry appeared briefly on Radio Aire, hosting a 'Heckle Hendry' hour long phone-in on Sunday morning. And that 94.6 frequency Leeds launched on was later the FM home of Aire when it launched.